As in all precision machines, the accelerating mass of the stage introduces deformation and vibrations in the frames, negatively influencing attainable accuracy. 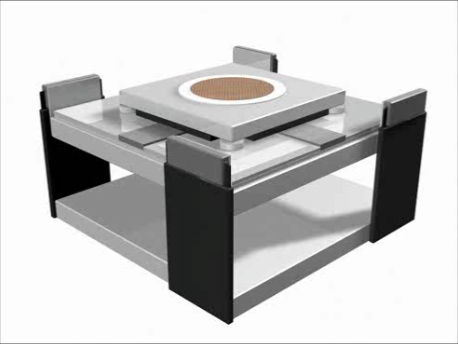 This effect is counteracted by an active mount system: linear motors generate counter forces in the frame that will keep vibration on a minimal level. These counter forces are both feed forward signals from the stage motions, and feed back signals to suppress disturbances introduced by the facility floor.